The Important Things For Children | Children Are Our Future Now! Nature is a teacher. 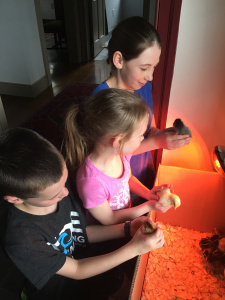 Children learning to love and to care when they hold baby chicks. Their world suddenly becomes joyous. A trip to a farm. Doing things you have never done. Riding a tractor. And driving a tractor. Thrilling. Bravery needed. Seeing the world of nature. Farm life. The best life. Batteries not included.